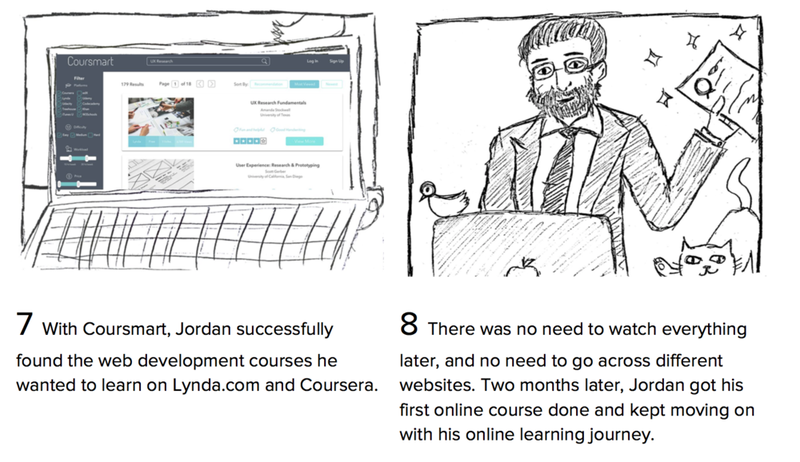 Think Yelp!, but for online courses. Coursmart is a platform designed to help users find the best online course for them. It’s also an online community where users can exchange their learning experiences with each other. "How can we help users find the right online course to meet their needs?" MOOCs (Massive Open Online Courses) have been heralded as the next big revolution in higher education. They are transforming the educational landscape, with millions of people already enrolled across hundreds of courses from top institutions through various provider platforms. With hundreds of new courses coming online every year and little or no feedback about their quality, the issue of how to find the courses which are right for an online learner taking into account his/her schedule, interests, and long-term career aims becomes pressing. For instance, from the description, the course might sound like a practical course but after going through 2 or 3 modules, you find out it is a theoretical one. To save online learners several hours while discovering whether the courses are the right fit for them, we decided to design and prototype a crowdsourced online course review platform. Coursmart was a class project for a course at the University of Texas at Austin. The project began in September 2016 and wrapped up in December 2016. In our user research phase, we conducted 5 contextual interviews to gather qualitative data from online learners. After the first round contextual interviews, we found more questions that needed answers, so we completed a second round of in-depth interviews with 16 online learners. From the quantitative side, we distributed a survey via Qualtrics and ended up getting 76 valid responses. To make data meaningful, we did data visualization and analysis for our survey results and built an affinity diagram with qualitative data we collected. The interview questions were designed to gather information of the interviewee’s experience with online courses, for example, what kinds of courses they would like to take and how they found the courses. Moreover, we also asked them about their experience with writing and sharing courses ratings and reviews. Focusing on the searching and finding design feature, we wanted to understand users needs when they decided to choose a course better. So, we started the second round in-depth interview with questions, like “Have you taken online courses ? If so, tell me your experience of finding and deciding to take them”, to start the conversation, also to recall their memories of choosing an online course. Then we asked a bunch of questions to dig into factors like what they cared about when they made decisions and what features would make a class fit to their needs. For example, we asked them how they decided to choose a particular class, and what they hoped to know from others before they took that class. A Qualtrics survey with 17 questions was distributed from Oct. 14th to Oct. 23rd. We were motivated to find out online learners’ experiences of choosing and taking courses, including why they would consider taking a course, why they drop a course, and whether/how they share a course with others. There were 76 respondents completed the survey and most of them ranged in the age from 18 to 34. 97% of the respondents are students or professionals. By analyzing the results of the survey, we had a better understanding of trends in online learners’ needs. A lot of people took online courses because some courses are only provided online or the topics are related to their research. Some people took online courses for self-improvement purpose or their interests in some subjects they haven’t learned before. Most of users search the courses they want from the platform they have used or from search engine directly and they don’t know other methods to search a course. A lot of people decided to take the courses just because they saw a good advertisement from somewhere. Users like to see the syllabus, table of contents and keywords to find the course which meets their needs. The instructor and the university are also the factors that can influence users’ decisions to take a course or not. Users prefer to see others’ reviews and recommendations when they are going to choose which courses they would like to take. Users feel the difficulty of a course is very hard to measure. Users feel the online courses lack the interaction between instructors and students. Users would like to read the reviews of courses but they hardly write the review. Users are more likely to share what they have learned in the social media. Users would rather have face-to-face recommendations with friends about the course they like than other methods. We generated a user journey map from our data collection, to interpret the overall story from an individual’s perspective of their decision-making process and the actions they would take when taking an online course. We pointed out 4 different aspects - stage, goal, activities, and touch points (including pain points and opportunities), to see through their interaction process. Jane Cooley is one of our target audiences. She tries to understand her class at school better by taking several online courses on her own. However, she always makes bad decisions when she chooses courses online, either the content is too difficult, or the professor has bad teaching skills. None of this information can be found while she is searching on the online course platforms and looking through the description and title of the course. Even the reviews are usually too general to be helpful. She wants to know how others with the same background as her feel after they finish the course, also to see what they gain from the class, so that she can make the decision based on these. In the ideation phase, we gathered our user research data and generated some insights as the foundation for our design brainstorming time. Then we used storyboard to give a scenario that how Coursmart interacts with our users and helps them to overcome the problems they met. From storyboard, all of us gained a stronger consensus of the goal of our design and the pain points that we aimed to solve for our users. So we generated our required features for the website and its function, and each of us came up with our own designed wireframes of the screen before we collaborated our final low-fidelity prototype. 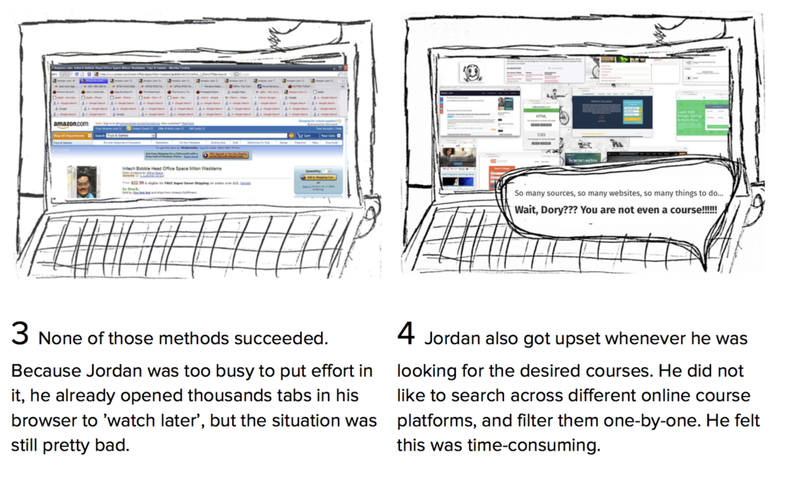 In our storyboard, we wrote up a story about the interaction between Jordan and Coursmart, including the problems he met, the way he found out Coursmart, and how Coursmart solved his problems and helped him to succeed. This storyboard helped us to identify the challenges we want to tackle and crank out the solution in the next step. A convergent process to define the required features we should definitely have in our final product. We think searching is an indispensable feature in our design. We want to help our users get a broader view of the potential candidates so that they could also have a better decision-making process when it comes to taking an online course. We figured there are some missing details that users really want to see in an online course. Through providing more details, our design can help users to have a deeper understanding of the courses. Reviews are the principal design feature in this project. From the user research, we found pain points that user had within the review features. We would like to come up with a solution that could motivate people to not just read other’s reviews but also contribute to the community and exchange the information. One of our insights was “it’s hard to rebuild the classroom environment”, which inspired us an idea of giving a common classroom interaction to our design. Let users exchange their learning experience and some of their projects would help users to engage more in an online course. We want to integrate different online courses accounts for users so that our design can be a central platform that they access to whenever they need to take online courses. We’d like to build an online community where users can have discussions with other people who are taking the same course, in order to mitigate the feeling of isolation and provide motivation to keep the online course progress. We created 4 versions of prototype (low-fidelity, medium-fidelity, high-fidelity I, and high-fidelity II) in the prototyping and implementation stages. We used Balsamiq and Marvel App for Low-fi prototype, and Sketch App, InVision, and Adobe Photoshop for the rest of higher-fidelity prototypes. As the iterative design process, we conducted usability testing following each round of prototyping. 6 testing subjects participated the low-fidelity prototype usability testing, 5 in the medium-fidelity testing, and 12 online users for two rounds of high-fidelity testing on UserTesting.com. At the end, we had users evaluate our final product with System Usability Scale (SUS), as the result, we got a score of 82.5 which is ranked as level A - People love your site and will recommend it to their friends. THE END: THANK YOU FOR WATCHING!